I hit up FamilySearch this weekend to do some miscellaneous research. 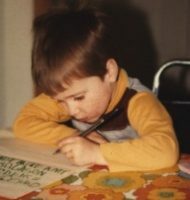 I happened to see their collection of records for the Czech Republic (or Czechoslovakia) and since my wife’s great-grandmother, Anna (HUIZEL) COLLINS, was born there, I thought I’d browse them. Unfortunately, I didn’t find anything useful. Though, while looking through their wiki pages on the records, I did happen to somehow find my way over to the Digital Archives: State Regional Archives Trebon. According to their site, “users can research digitalized materials of State Regional Archives Trebon and State District Archives of South Bohemia.” That sounded promising since our records indicate the family was from the Netolice region of South Bohemia in the Czech Republic. I jumped right into their “Parish Registers” section and then into “Roman Catholic Church.” Fortunately, they had a map of all of the parishes, so I was able to see which parish Netolice was in. It happens to be its own parish, so that’s good. It’s a pretty amazing website, if you have Czech ancestors from this region. Dozens and dozens of digitized parish records from as far back as the 14th and 15th centuries. Some are in the process of being indexed. Their system even allows you to bookmark pages, etc. While the viewer and website and slightly clunky, I wouldn’t say they’re any worse than Ancestry or FamilySearch, just different. I opened the list of registers. Netolice seems like a big area. They have parish records from 1656 to 1929 inside of 62 books. I spent a few hours, on and off, searching through the birth records around the time of her birth, but found nothing. I also tried some of her siblings with no luck. I also had no luck finding their parent’s marriage record. I actually didn’t even see the HUIZEL surname or anything similar, though I did run across her mother’s maiden name (REINDL) once, which was a glimmer of hope. I decided to start searching the parishes around Netolice since it was a larger area and may have been written down since it was the biggest place in the area. 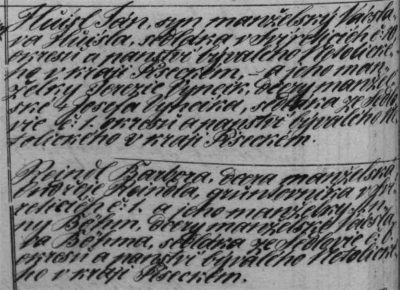 No luck in the first few, but then I started on the Němčice parish records. I found a marriage record for Jan HUISL and Barbara REINDL in the 1856-1885 Marriage record book. Jackpot! I was somewhat lucky since their marriage was listed as 1864, which I didn’t find, but I kept browsing the records looking for common names and just happened to run across it in 1868. After some work on translation, it seems like they also list the bride and groom’s parents along with both of their mother’s fathers and the current occupation and location of everyone. It lists Jan’s parents as Vacslav HUISL and Terezie VYNEIK and her father as Josef VYNEIK. Barbara’s parents are Andreje REINDL and Anna BOHM and her father is Vacslav BOHM. Most of them were farmers (sedlaka), though Andreje wasn’t but I can’t seem to translate/transcribe his occupation, yet. I still didn’t have a lot of luck with Anna’s siblings, but then I noticed they have some records broken down into villages in the parish. I went through those and had good luck in the village of Zvěřetice. This was listed as Jan and Barbara’s residence in their marriage record, though it was spelled slightly different. Interesting to note on the baptism records of their first two children is that they were born before Jan and Barbara were married. Mary in 1865 and Jan Nep (or something similar) in early 1868. Both records were updated to make the children “legitimate” when their marriage was finalized. This is probably why other records indicate they were married in 1864. I did notice a lot of “illegitimate” births in the records (or entries that only had a mother listed.) That seems surprising in this time period. I have yet to find my wife’s great-grandmother’s records. It doesn’t look like they have the records for the 1881 area available online, yet. From what I can tell it looks like they have some missing due to privacy issues, though I have also seem some that are for more recent time periods, so I don’t know. All I can see is this message when I hover over the records for her baptism book, “This parish register will be available online after 2033” so I may have some time to wait. 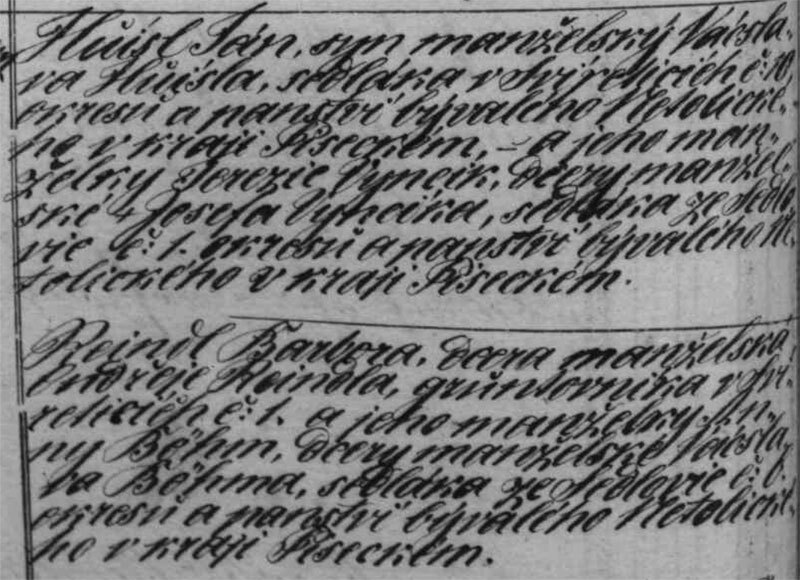 So, if you have Czech ancestors, definitely give the digital archives site a look. Besides parish registers they also look to have photos and other useful information about the area. No, I didn’t. Still pretty new to the Czech stuff, but thanks for the link! I haven’t had too much luck at that site yet, but I’m hoping it is because I haven’t put in enough time yet. I had a cousin in Prague share his tree with me and I’d like to get some sources to go with it… See ya around the Czech out! Brian – I found your blog in your recent post on Blanka’s blog. My husband is Czech and we were so fortunate that a distant relative of his found us on the web. He has been helping us locate Czech recors in the archives, and we went to Prague 2 summers ago and came home with 3,000 digital photographs of birth, marriage and death records from the Zamrsk Archives. Now, all of those are online! We live in a great time, don’t we? The Catholic Church records are treasure troves of info. It’s been quite a challenge learning to read the old German script and Czech words, but our cousin has been a huge blessing in helping us. Thanks for stopping by! Yes, the amount of readily available Czech records online has been a great surprise to me. I don’t know of another country that I actively research (besides the US) that has so many digitized records available.